Several games have taken the Minecraft approach to world building and slotted it into an FPS setting: the quite decent Blockstorm and the helpfully titled Guncraft are two examples that spring to mind. Now there's Gunscape, an 'FPS construction kit' which has been in Early Access for a while now, but is poised to launch proper this March. The Minecraft-esque FPS is a crowded niche, but Gunscape comes with the benefit of being free-to-play. Deathmatch map creation will probably be the core of the game, but single-player and cooperative PvE design is encouraged, too. 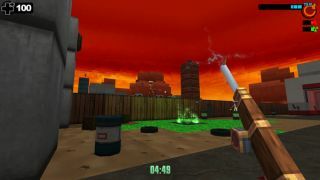 The game's skins are themed around FPS classics such as Wolfenstein and Quake (to name just two), and each theme features its own textures, enemies, weapons, skyboxes, guns and obstacles. Gunscape launches March 2. If you'd prefer to jump into the Early Access build, it's available right now on Steam.